Lok Sabha Elections will be held in seven phases across the country from April 11 to May 19. The results will be declared on May 23. 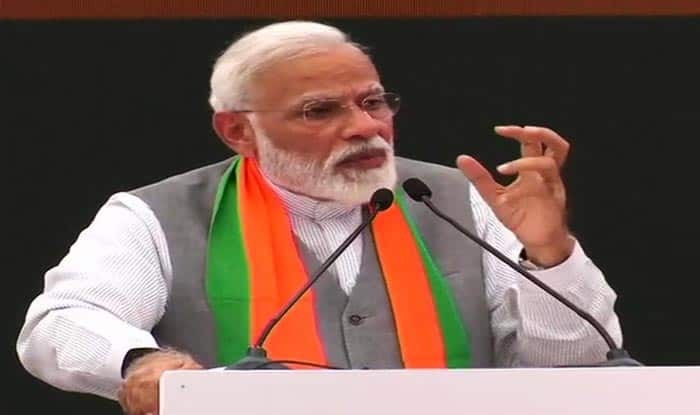 New Delhi: After releasing the Bharatiya Janata Party’s (BJP) sankalp patra for Lok Sabha elections 2019, Prime Minister Narendra Modi said that the government was moving ahead with ‘one mission and one direction. “Rashtravaad hamari prerna hai, antoydaya hamara darshan hai aur sushasan hamara mantra hai. Desh neeti chalane ke liye hume multi dimensional level par kaam karne ki zarurat hoti hai aur humne use sankap patra mein shaamil kiya hai (Nationalism is our inspiration, uplifting the marginalised is our vision, good governance is our mantra. To run a national policy we need to work on a multi-dimensional level and that has been included in a ‘Sankalp Patra),” PM Modi said. Showering praise on BJP’s ‘Sankalp Patra’ PM Modi said,”Every party will bring manifesto for the elections. But Rajnath ji has spent two-three months for our manifesto. Probably, this is for the first time that the manifesto is based on a government that will continue to remain in power,” PM Modi said after party chief Amit Shah and Union Ministers Rajnath Singh, Arun Jaitley and Sushma Swaraj outlined main highlights of the 45-page BJP manifesto. In its manifesto, the ruling party promised 75 promises including Ram Mandir, housing for all by 2020, doubling of farmers’ income by next year . Besides the party also pledged to implement Uniform Civil Code and construction of ‘Ram Mandir’ at dispute site in Ayodhya ‘within the framework of the Constitution’.